Best described as “good, but not as good as the ones with Alan Moore writing them”. 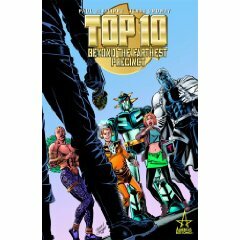 Top Ten is one of Moore’s lighter works, best described as “Hill Street Blues with superpowers”. That’s not a criticism, as it’s an entertaining read and one of the stories in the series, “Traffic Duty” in vol. 2, ranks among Moore’s most moving work. Absolutely everyone in this world has superpowers; the cops, the villains, the civilians, everyone. One of the most fun aspects of the series is figuring out that it would work perfectly well if nobody had powers at all (guns instead of super-strength, uniforms instead of Lycra, car crashes instead of teleporter malfunctions, racial segregration instead of robot / human housing projects), but the fact that they’re talking dogs / wearing Lycra / seeing sounds and tasting colours just makes it a little more interesting. “Beyond the Farthest Precinct” is a fun continuation of the whole series, but it’s not quite as complex as the earlier works. Still worth picking up if you want an entertaining read and you want to catch up with your favourite characters from the earlier books. Another book from our recent focus on crime comics. 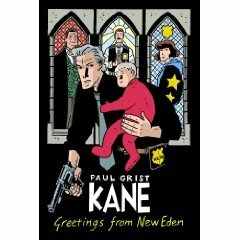 Kane is a NYPD detective recently returned from work under the cloud of having shot his partner; he’s been cleared by Internal Affairs, but one or two people at the station are not too happy about him being back. Meanwhile, there’s a kidnapped child, a bomb, and a hooligan in a bunny costume to worry about… Enjoyable. Not a “write home about, change your life” book (it’s not the next Criminal), but a diverting cop thriller with fun black and white artwork. If you like Ed McBain’s 87th Precinct stories, this may be one for you. 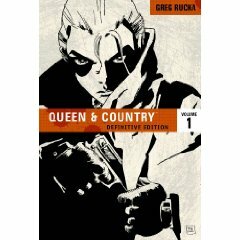 Greg Rucka’s spy thriller, following the exploits of a crack team of MI6 spies from London to Baghdad. Drawn in black and white, it’s gripping and challenging reading, as our heroes fight to stay alive and complete their missions, whilst privately wondering if they’re doing the right thing – or indeed what the right thing to do is, in a murky environment where the rules change from minute to minute. An action thriller with heart, realism and strong female characters. If you like Spooks, pick this up, you’ll love it.